West Sound CoderDojo, a free computer programing workshop for kids, has landed a permanent home at Western Washington University’s Olympic College center in Poulsbo. West Sound Technology Association booted up the CoderDojo this spring as a nomadic program, offering courses at different places around the county. The partnership with WWU will give coders a consistent meeting space. West Sound Coder Dojo’s first class at the WWU center in Poulsbo will take place at 10:30 a.m. Saturday, July 11. Tickets are free but registration is required. You can read more about CoderDojo’s move here and find my story about the program here. Check the West Sound Technology Association website for information about upcoming classes. Last Saturday I sat in on the first meeting of West Sound CoderDojo. The group was organized by West Sound Technology Association to offer computer programming classes to kids and their parents, as part of the global CoderDojo movement. The Saturday classes are free for participants and staffed by volunteers, but of course they cost money to host. CoderDojo meetings require large gathering spaces with Wi-Fi connectivity, and the group tries to provide loaner laptops for kids who don’t have them. 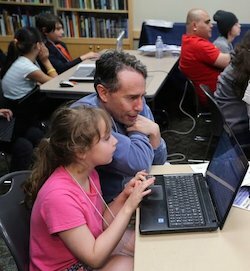 West Sound CoderDojo just launched a GoFundMe campaign to help fund their courses. The group is hoping to raise $10,000. The campaign is posted here. Improving technology education in Washington will be the subject of an upcoming summit in Suquamish. The discussion, hosted by the West Sound Technology Association, will feature Renee Radcliff Sinclair, leader of strategic initiatives for Apple Inc. and a former state representative. Other participants include U.S. Rep. Derek Kilmer, Olympic College President Dr. David Mitchell, and WSTA Director Charles Keating. They’ll discuss how technology is transforming student learning and and whether state education policy is keeping up. The program runs from 10:30 a.m. to 1 p.m. Oct. 16 at Clearwater Casino. Pre-registration is requested. See full information here.